I promise you can eat more than leaves. I began my trip to Vietnam with low expectations for Vegetarian options. I’m not at all denying that Vietnamese cuisine is meat-centric, however I was pleasantly surprised to see a significant demand for vegan & vegetarian options! The thing about travelling is that everyones experience is subjective. One person’s culinary experience could be completely opposite to another’s. You could go to the same country, with the same tastes and same timeline as me - and fall flat on your face. That being said, I genuinely found that being vegetarian in Vietnam was không sao (no problem). 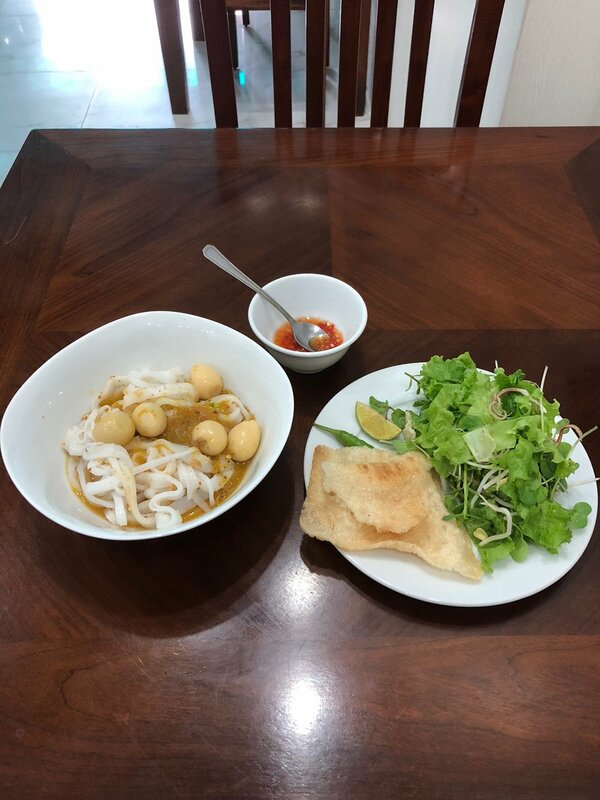 To give you the best chance of making the same conclusion, I’ve got a few bits of advice to help you ditch the meat and find the best vegetarian food Vietnam has to offer. The distinction between vegetarian and vegan in Vietnamese is not always clear, so it can also be helpful to know a few extra phrases to get your needs across. If you’re scouring Google Maps or searching the streets for local food, keep an eye out for the following. Even in smaller towns, Vietnamese vegetarian eateries will be marked. There’s a common misconception that being vegetarian/vegan means no local food. There are quite a few local dishes that can be easily adapted to suit your veggie needs; you just have to ask! You can’t go far in Vietnam without bumping into Banh Mi! This classic Vietnamese sandwich is built on a single-serve baguette and stuffed with savoury fillings. It combines the French & SEAsian cuisine with condiments such as coriander, cucumber, pickled veggies and of course pate. For the veggie lovers out there, make sure you subtract the pate (because eating force-fed duck is pretty f*cked up if you ask me). Morning Glory was one of my go-to sides at any small local restaurant. Also known as water spinach, this yummy green dish is usually sautéed in oyster sauce and garlic. If you’re vegan ask to sub out oyster and sauté in soy! White Rose is a wicked awesome way of doing dumplings. Originating in Hoi An, these thinly sliced sheets of rice paper are steamed until the edges fold up like little rose petals. They’re usually topped with crispy shallots and a small spoonful of pork, but can easily be adapted for vegetarians using mushrooms or other minced veg. Complemented by a chilli, sugar and lemon dipping sauce (which sometimes contains shrimp paste, vegans beware!) - White rose is a spicy sweet loveable local dish. Summer rolls are a lighter (better for you) take on fried spring rolls. 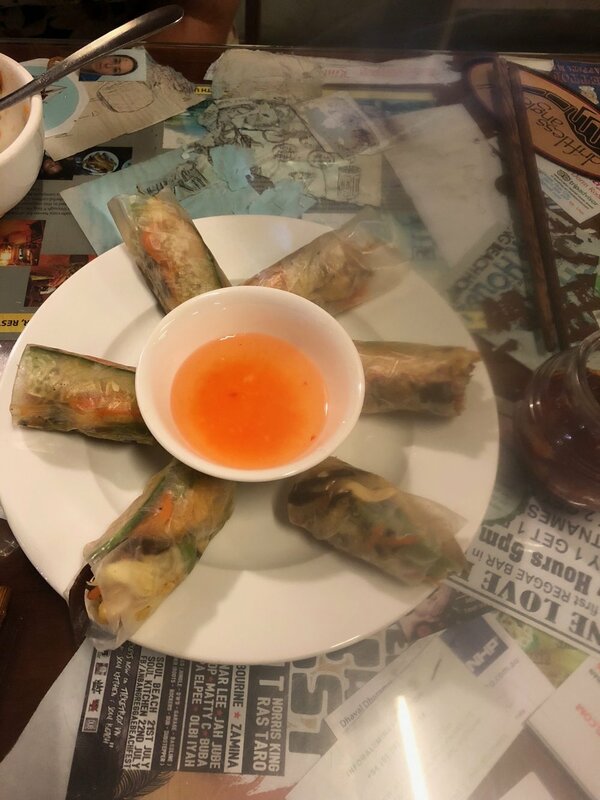 Traditionally stuffed with pork and shrimp, I had no trouble finding vegetarian summer rolls with quail eggs, or vegan rolls with tofu and mango! Stay tuned for an additional post about my favourite veg-friendly destination in Vietnam!